Objectives: To assess the effects of bimaxillary surgery on Class III subjects with mandibular asymmetry, and to compare the effects of the type of surgery performed in the mandible on the facial profile especially in the presence of facial asymmetry. Materials and Methods: Thirty-six patients in whom imbalance between the maxilla and the mandible were corrected by Le Fort I osteotomy combined with bilateral intraoral vertical ramus osteotomy (BIVRO group, n=9), bilateral sagittal split ramus osteotomy (BSSRO group, n=14), or a combination of intraoral vertical ramus osteotomy (IVRO) and sagittal split ramus osteotomy (SSRO) (IVRO + SSRO group, n=13). Cephalograms were taken before surgery (T1), and 1 year after surgery (T2). Hard and soft-tissue changes were compared. Results: The postsurgical findings showed that greater mandibular backward displacement and greater upper lip forward movement were more pronounced among BIVRO group when compared with BSSRO group. Upper lip relation to E-line showed greater improvement in BIVRO group than BSSRO and IVRO + SSRO groups. The ratios of corresponding mandibular soft to hard tissue movements were higher than that of maxillary movements and were more pronounced in IVRO + SSRO and BSSRO groups when compared with BIVRO group. Conclusion: IVRO surgical technique appears to be more effective in positioning the mandible more posteriorly and improving upper and lower lips position and competence. Surgical correction of Class III dentofacial deformities may be accomplished by mandibular setback, maxillary advancement, or a combination of both. Intraoral vertical ramus osteotomy (IVRO) and sagittal split ramus osteotomy (SSRO) or combinations of both (IVRO + SSRO) are representative surgical procedures for various forms of mandibular jaw deformity. ,, In some instances, the choice between these procedures is not straightforward. The treatments of choice are based on the extent of the deformity, degree of desirable jaw movement, and anticipated soft tissue changes following surgical intervention. Although SSRO is the most popular method; it has many disadvantages including alveolar nerve injury, long operation time and relapse. IVRO has been reported to be a suitable method in case of severe mandibular asymmetry to achieve stable mandibular results. , However, the most important goal for orthodontists and maxillofacial surgeons is to correct not only dental malocclusions but also to improve soft tissue profile after bimaxillary surgery. Facial soft tissue change that occur as a result of orthodontic treatment is a gradual alteration in facial features, while orthognathic surgery results in sudden and dramatic changes. It is therefore essential to be able to reliably predict postoperative soft tissue changes resulting from orthognathic surgery so that aesthetic results can be more accurately planned. Information on changes in the facial profile and hard to soft tissue ratio following surgical correction of mandibular prognathism has been previously reported. ,,,,,, There has been no comparative study into bimaxillary surgery to investigate the influence of the three different surgical methods performed on the mandible on the postoperative soft tissue profile changes in Class III asymmetric subjects. The aims of this study were therefore to assess the effects of bimaxillary surgery on Class III subjects with mandibular asymmetry, and to compare the effects of the type of surgery performed in the mandible on the facial profile especially in the presence of facial asymmetry. This retrospective chart and radiographic study relied upon the records of 36 skeletal Class III patients with mandibular protrusion and mandibular deviation (20 females and 16 males), mean age 20.7±4.46 years (range: 17-35 years) who treated at Niigata University Medical and Dental Hospital, Japan. All patients were selected on the basis of the following criteria: Were diagnosed as having Class III malocclusion clinically and radiographically, were treated surgically by Le Fort I osteotomy in the maxilla combined with BIVRO, BSSRO, or IVRO + SSRO in the mandible, having mandibular asymmetry more than 2.2 mm,  and had no cleft, craniofacial syndrome or trauma. Subjects were divided into three groups: BIVRO group: Comprised 9 patients (5 males and 4 females) with mean age of 19.4±2.06 years, (range: 17-23 years) at surgery who had undergone Le Fort I osteotomy in the maxilla and BIVRO in the mandible. BSSRO group: Consisted of 14 patients (4 males and 10 females) with mean age of 20.2±4.08 years, (range: 17-32 years) at surgery who had been treated by Le Fort I osteotomy and BSSRO in the mandible. IVRO + SSRO group: Comprised 13 patients (7 males and 6 females) with mean age of 22.1±5.8 years, (range: 17-35 years) at surgery who undergone Le Fort I osteotomy and IVRO in one side and SSRO on the other side. Selecting the type of mandibular osteotomy was based on the presence or absence of TMJ symptoms, the expected bony interference between segments and potentially excessive rotation of the proximal segment. Bimaxillary surgery was done by four senior surgeons at Niigata University Medical and Dental Hospital, Japan. All patients had single segment Le Fort I osteotomy as described by Bell  followed by down-fracture and mobilization of the maxilla, moving it to the desired position. Then rigid fixation was applied using two titanium mini-plates in the posterior region and two absorbable poly-L-lactic acid plates (Fixsorb-MX; Takiron Co, Osaka, Japan) in the anterior region. In BIVRO group, IVRO was performed in both sides. The masseter muscle was detached from the lateral surface of the mandibular ramus and cut vertically using an oscillating saw. We did not perform any repositioning or fixation of the condylar segment. After surgery, the intermaxillary fixation was maintained for a mean duration of 14 days (range 14-16 days). In BSSRO group, the SSRO was performed bilaterally with the modifications of DalPont,  in which the split osteotomy is made at the region of the first or second molar and the teeth were placed in their planned positions using surgical splint following the mandibular split. Each condylar segment was fixed flexibly with titanium miniplates applied intraorally on each side using four monocortical titanium screws, each 2 mm in diameter. Intermaxillary fixation was maintained for a mean duration of 8 days (range 7-10 days). As for IVRO + SSRO group, IVRO was performed on the deviated side and SSRO was performed on the nondeviated side as described previously. 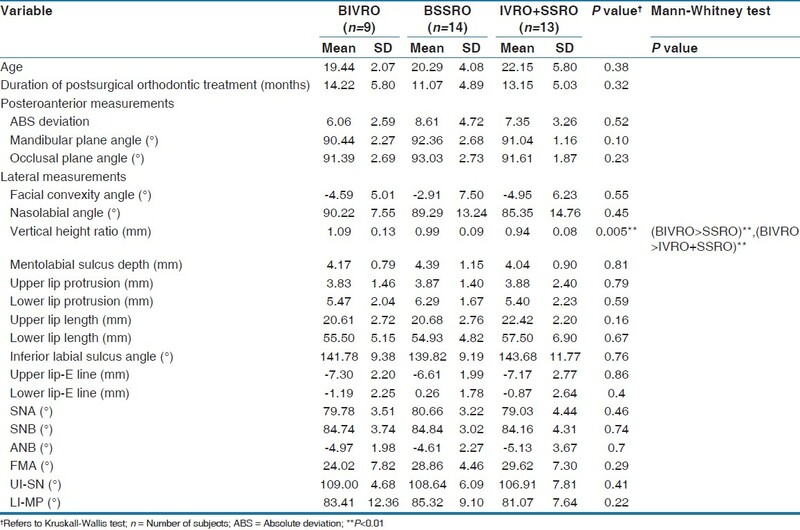 All patients had pre and postoperative orthodontic treatments; the mean postoperative orthodontic treatment time was 14.2, 11.07, and 13.1 months in BIVRO, BSSRO, and IVRO + SSRO, respectively. In order to evaluate the post-surgical changes, lateral and frontal cephalograms were used. The cephalograms were taken at 1 week before surgery (T1), and at 1 year after surgery with a mean time of 12.2±2.2 months (T2). 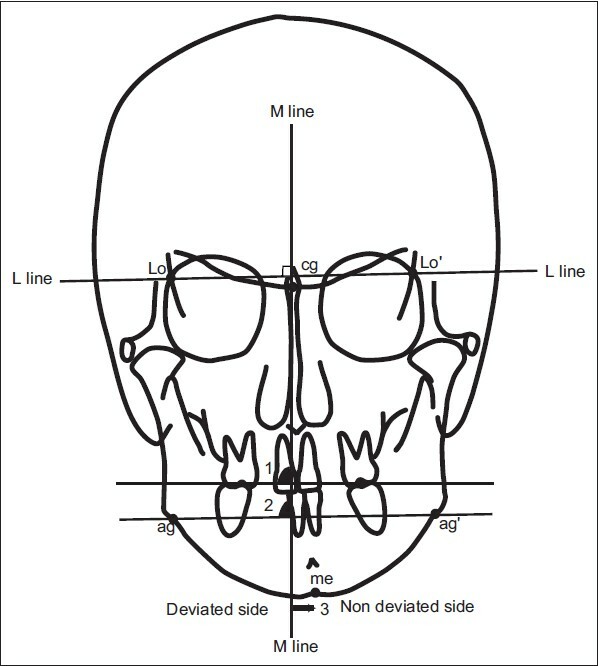 On the frontal cephalograms, 1 linear and 2 angular measurements were adopted [Figure 1]. Lateral cephalograms were analyzed using a modified soft tissue analysis of Legan and Burstone  and Lew et al. [Figure 2], [Figure 3], [Figure 4]. All cephalograms were traced and measured by hand on 0.003-mm matte acetate paper (Yunipa, Kimoto, Tokyo, Japan). All tracings and measurements were done by the same researcher. The normality test of Shapiro-Wilkes was applied to the data. The data were found not normally distributed. Wilcoxon signed rank test was used to test any significant change in the cephalometric variables within each group. Comparison between groups were done using Kruskal-Wallis test followed by Mann-Whitney test. Pearson correlation analysis and linear regression were used to assess the degree of correlation between soft to hard tissue changes. All statistical analyses were done using Stat View statistical software program (SAS Institute Inc., Cary, NC, USA). Our level of significance was set at P<0.05. An error analysis of cephalometric tracing and measurements was performed using 40 radiographs traced twice at 1-month interval. The method error was calculated using intraclass correlation coefficient. The results demonstrated that the reliability for all measurements was excellent and were between 0.81 and 0.99. [Table 1] shows characteristics and pretreatment soft and hard tissue morphology of the three groups. No significant differences were found between groups except that BIVRO group had larger vertical height ratio than BSSRO and IVRO + SSRO groups (P<0.01). [Table 2] shows the surgical changes of the three groups. The mean maxillary advancement measured at point A was 2.5±2.05 mm (P<0.05) in BIVRO group, 2.29±1.73 mm (P<0.01) in BSSRO group, and 2.45±1.76 mm (P<0.01) in IVRO + SSRO group. The mean mandibular setback measured at point B was 8.06±1.69 mm (P<0.01) in BIVRO group, 5.54±3.33 mm (P<0.01) in BSSRO group, and 6.15±3.86 mm (P<0.01) in IVRO + SSRO group. Setback tended to be smaller in BSSRO group and IVRO + SSRO group than in BIVRO group. All groups showed significant surgical changes in the entire hard tissue variables in the horizontal direction. BIVRO and IVRO + SSRO groups showed significant surgical changes in all of the soft tissue variables in the horizontal direction, whereas BSSRO group had only three significant surgical changes in the soft tissue labrale inferius (P<0.01), sulcus inferius (P<0.01) and soft tissue pogonion (P<0.01). Significant vertical changes were more pronounced in the hard tissue variables than soft tissue variables and were more pronounced in IVRO + SSRO and BSSRO groups; anterior nasal spine (BSSRO: P<0.05, IVRO + SSRO: P<0.01), lower incisor (for both groups, P<0.01), and supramentale (both groups, P<0.05), while BIVRO group showed only one significant change in the upper incisor (P<0.05). As for soft tissue vertical changes, only one significant change was observed in BSSRO group (P<0.05), and IVRO + SSRO group (P<0.05), while BIVRO group did not show any significant change in the soft tissue variables in the vertical direction. Statistical comparison between groups revealed that there were no significant differences between groups except that, BIVRO group had greater mandibular backward movement at the hard tissue pogonion, and greater forward movement of the upper lip than BSSRO group (P<0.05). [Table 3] shows the surgical changes of the angular and linear measurement of the three groups. More significant surgical changes were observed in BSSRO (17 changes), compared with BIVRO group (14 changes) and IVRO + SSRO group (15 changes). Comparison between groups revealed that BIVRO group had greater upper lip forward movement than BSSRO group (P<0.001), and more upper lip improvement in relation to the esthetic line than BSSRO group (P<0.01) and IVRO + SSRO group (P<0.05). Correlation between corresponding mandibular soft to hard tissue movements in the horizontal direction were generally higher than that of the maxillary movements especially in BSSRO and IVRO + SSRO groups. Vertically, IVRO + SSRO group had more significant correlations between soft and hard tissue variables compared with that found in BSSRO and BIVRO groups. In the sagittal plane, strong correlations were found between labrale inferius and lower incisor (BSSRO group: r=0.96; P<0.001, IVRO + SSRO group: r=0.89; P<0.001), sulcus inferius, and supramentale (BIVRO group: r=0.89; P<0.001, BSSRO group: 0.95; P<0.001, and IVRO + SSRO group: r=0.83; P<0.001), and in the soft to hard tissue pogonion (BIVRO group: r=0.86; P<0.01, BSSRO group: 0.96; P<0.001, IVRO + SSRO group: r=0.91; P<0.001). In the vertical plane, significant correlation between the corresponding soft tissue subnasale and hard tissue subspinale was observed in BIVRO group (r=0.68; P<0.05). In BSSRO group, significant correlations was found between pronasale an anterior nasal spine (r=0.62; P<0.05). As for IVRO + SSRO group, significant correlation was found between labrale superius and upper incisor (r=0.75; P<0.01), sulcus inferius and supramentale (r=0.59; P<0.05) and soft to hard tissue pogonion (r=0.64; P<0.05). The ratio between mandibular soft to hard tissue movement ranged from 0.32 to 0.63 in BIVRO group, 0.28 to 1.08 in BSSRO group, and 0.59 to 1.1 in IVRO + SSRO group. For maxillary variables, the soft to hard tissue movement ratios ranged from 0.30 to 1.04 (BIVRO group), 0.19 to 0.92 (BSSRO group), and 0.18 to 1.28 (IVRO + SSRO group). The soft tissue facial profile has been considered by patients, orthodontists, and maxillofacial surgeons as an important objective of nonsurgical and surgical orthodontic treatment, especially in patients with Class III malocclusion. Although many studies have reported the soft and hard tissue changes after one-jaw surgery or two-jaw surgery, there has been no comparative study to investigate the effect of the type of surgery performed in the mandible on the postoperative facial profile in Class III subjects. The subjects selected for this study all presented with a need for a combination of maxillary advancement and mandibular setback confirmed by the presurgical mean values of ANB angle (BIVRO group: - 4.97, BSSRO group: - 4.61, and IVRO + SSRO group: - 5.13 degrees). Beyer and Lindauer  have suggested that the mean threshold for acceptable dental midline deviation is 2.2 mm as it appears to be easily detectable by most individuals. According to their suggestions, only subjects with mandibular midline deviation more than 2.2 mm were included. All patients presented presurgically with a concave profile and protrusive lower lip. The postsurgical values showed that an orthognathic profile had been achieved by movement of both jaws anteroposteriorly, improved facial convexity, improved labiomental fold depth, and improved upper and lower lip positions. Lin and Kerr  have suggested that the position of the hard tissue pogonion is not suitable for representing the anterior part of the mandible as some of Class III patients possess a prognathic chin which may exaggerate the dental base discrepancy. Houston et al. have reported that the maxillary bony landmarks are being destroyed during surgery particularly ANS with Le Fort I surgery and this is likely to reduce the soft to hard tissue ratio and influence the correlation horizontally and vertically. We therefore used point A in the maxilla and point B in the mandible as a cephalometric reference points for measuring the amount of maxillary advancement and mandibular setback. It is well known that all orthognathic surgical procedures produce postoperative edema; this edema is expected to eliminate by 6 months after surgery. In this study, the mean postoperative follow-up time for the three groups was longer than 12 months, thus residual edema would no longer play any role in the observed soft tissue changes. It has been reported that the direction and magnitude of surgical movements may play a great role in determining the soft tissue changes,  and that actually what was observed in our current study in which the largest maxillary and mandibular movements occurred in the horizontal direction and less movement occurred in the vertical direction. 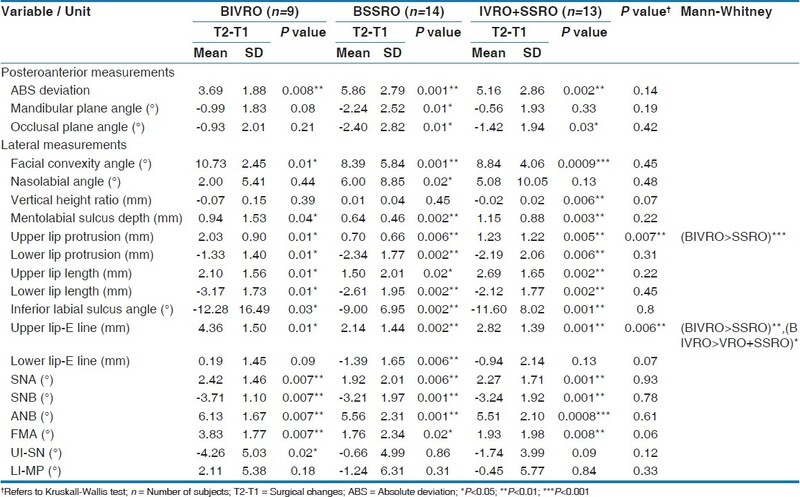 Even though BIVRO group had larger pretreatment vertical height ratio than BSSRO and IVRO + SSRO groups (P<0.01) but fewer postoperative significant changes in the vertical plane were seen in this group compared with the other two groups, [Table 2]. Comparison between groups revealed that, BIVRO group showed greater mandibular backward movement measured at the hard tissue pogonion (- 8.62 mm, P<0.01) than BSSRO group (- 5.14 mm, P<0.01) and IVRO + SSRO group (- 6.92 mm, P<0.01). Previous investigations reported that the type of surgery and the amount of setbacks might play a significant role in the postoperative stability and that more relapses occurred when the setback were larger. , Al-Gunaid et al.,  in studying the postoperative stability of deviated side and nondeviated side after bimaxillary surgery in Class III asymmetric patients have reported that; in Class III asymmetric patients there is a possibility of horizontal relapse of the mandible not only due to the difference of the right and left setback but also due to the mediolateral displacement in the posterior margin of the distal bone segment when the mandibular dentition was rotated to correct its deviation, indicating that IVRO procedure is favorable for asymmetric cases as it can cause less rotational displacement of the proximal segment. In the present study, greater mandibular backward movement, greater upper lip forward movement, and better upper lip relation to the esthetic line in BIVRO group were observed. 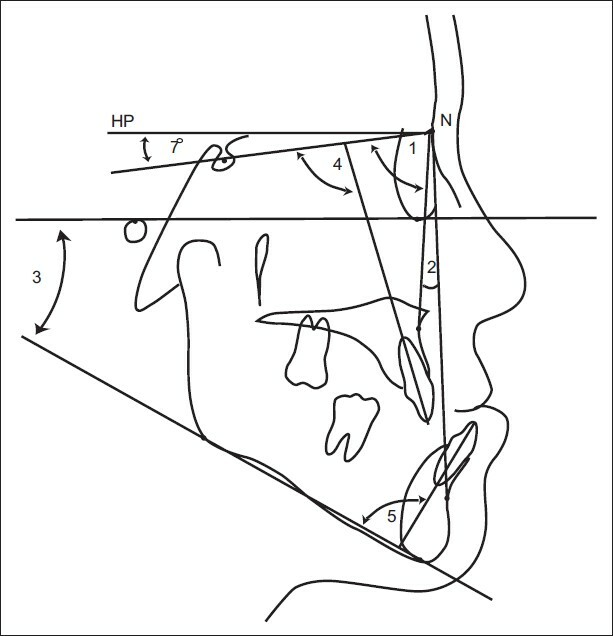 This hints that IVRO surgical technique could be helpful in treating severe mandibular protrusion and mandibular deviation as it allows the surgeon to position the mandible more posteriorly with different amount of mandibular setback between the right and left sides with less concern about the postoperative relapse. As a result, the facial appearance will be expected to improve, however, the present findings stand alone and further investigations are required before conclusions are drawn. Comparison between groups revealed that, BIVRO group had greater improvement in the upper lip position than BSSRO group, (P<0.01). This finding can be interpreted with reference to Gjφrup and Athanasiou  who reported that, due to the abnormal incisal relationship before surgery, the lip is kept in a pseudoposition as a form of adaptation and compensation. Since BIVRO group in our current study had more mandibular backward movement than BSSRO group, more normal incisor relationship will be achieved. When normal incisor relationship is achieved, the soft tissue overlying the incisors will improve lip competence and posture. 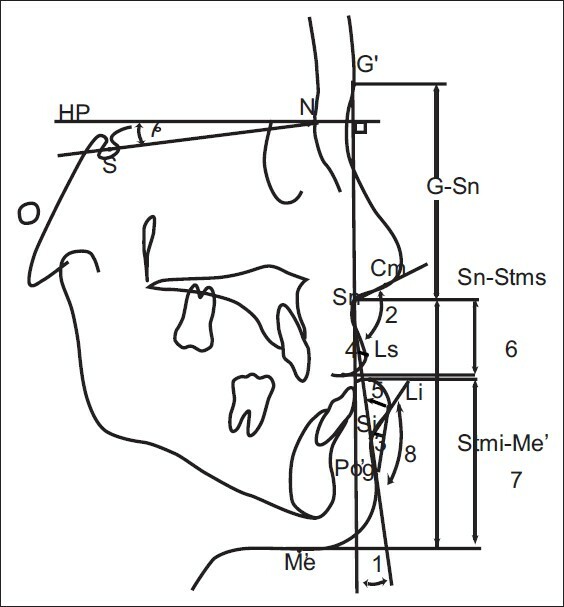 Although, there were no significant differences between pre and postsurgical angular relationships between mandibular incisal inclination and mandibular plane in all groups, the lower lip was significantly moved posteriorly; however, the ratio of lower lip (Li) to mandibular incisor (L1) change was 0.56:1, 1:1, 1:1 in BIVRO, BSSRO, and IVRO + SSRO groups, respectively. Lines and Steinhauser,  Ingervall et al.,  Suckiel and Kohn  reported a ratio of 0.75:1, 0.88:1, and 0.83:1, respectively, which is larger than that found in our BIVRO group and smaller than that found in BSSRO and IVRO + SSRO groups. The ratio of labiomental sulcus (Si) to point B movement was 0.63:1, 1:1, and 0.93:1, in BIVRO, BSSRO, and IVRO + SSRO groups, respectively. IVRO + SSRO and BSSRO groups were somewhat similar to that reported by Gjorup and Athanasiou,  (1.03:1); Fanibunda,  (1.07:); Ingervall et al.,  (1.06:l); and Robinson et al.,  (1:l), and higher than that reported by Lew et al.,  (0.89:1); and Marsan et al.,  (0.30:1) whereas BIVRO group was found to have smaller ratio than that of previous reports and higher than that reported by Marsan et al.,  The ratio of soft tissue pogonion to hard tissue pogonion change was 0.63:1 in BIVRO group, 1.01:1 in BSSRO group, and 0.83:1 in IVRO + SSRO. Lines and Steinhauser,  Fanibunda,  and Ingervall et al.,  reported a ratio of l:l, 0.94:l, and 1.07:1, respectively, which is similar to that found in BSSRO group, and greater than that found in BIVRO and IVRO + SSRO groups. In all groups, the correlation and ratios of corresponding mandibular soft to hard tissue movements was generally higher than that of the maxillary movements especially in BSSRO and IVRO + SSRO groups. Previous studies on single-jaw and bimaxillary surgery have explained the weaker soft tissue response to be related to the variability in soft tissue thickness, degree of deformity, and tonicity of the musculature, variability in the amount of anterior nasal spine resection, and maxillary bony landmarks being destroyed during surgery. , This is likely to reduce the soft to hard tissue ratio and influence the correlation horizontally and perhaps vertically. Vertically, the maxillary and mandibular soft tissue responses showed weak correlation to hard tissue. Previous studies suggested that the measurement error appeared to be greater in the vertical changes and was difficult to predict. , Our current finding is in agreement with these reports that accurate prediction of soft tissue changes in this dimension is difficult. In spite of the limitation of this study as including a relatively small number of patients; some obvious trends toward postoperative changes among each group included in this study are possibly helpful during prediction and treatment planning. IVRO appears to be more effective in positioning the mandible more posteriorly and improving upper and lower lips position and competence. 1. Nwoku AL, Palomero-Rodriguez R, Horch HH. The problems of correction of asymmetric mandibular prognathism. Int J Oral Surg 1974;3:229-33. 2. Harada K, Ono J, Okada Y, Nagura H, Enomoto S. Postoperative stability after sagittal split ramus osteotomy with condylar- positioning appliance and screw fixation: Asymmetric versus symmetric cases. Oral Surg Oral Med Oral Pathol Oral Radiol Endod 1997; 83:532-6. 3. Lai W, Yamada K, Hanada K, Ali IM, Takagi R, Kobayashi T, et al. Postoperative mandibular stability after orthognathic surgery in patients with mandibular protrusion and mandibular deviation. Int J Adult Orthodon Orthognath Surg 2002;17:13-22. 4. Mobarak KA, Krogstad O, Espeland L, Lyberg T. Factors Influencing the Predictability of Soft Tissue Profile Changes Following Mandibular Setback Surgery. Angle Orthod 2001;71:216-27. 5. Gjorup H, Athanasiou AE. Soft-tissue and dentoskeletal profile changes associated with mandibular setback osteotomy. Am J Orthod Dentofacial Orthop 1991;100:312-23. 6. Ghali GE, Sikes JW. Intraoral vertical ramus osteotomy as the preferred treatment for mandibular prognathism. J Oral Maxillofac Surg 2000;58:313-5. 7. Hall DH. Intraoral vertical ramus osteotomy. In: Bell WH, editor. Surgical Correction of Dentofacial Deformities, II. Philadelphia: Saunders; 1980. p. 890-5. 8. Louis PJ, Austin RB, Waite PD, Mathews CS. Soft tissue changes of the upper lip associated with maxillary advancement in obstructive sleep apnea patients. J Oral Maxillofac Surg 2001;59:151-6. 9. Lines PA, Steinhauser WW. Soft tissue changes in relationship to movement of hard structures in orthognathic surgery: A preliminary report. J Oral Surg 1974;32:891-6. 10. Kajikawa Y. Changes in soft tissue profile after surgical correction of skeletal Class III malocclusion. J Oral Surg 1979;37:167-74. 11. Fanibunda KB. 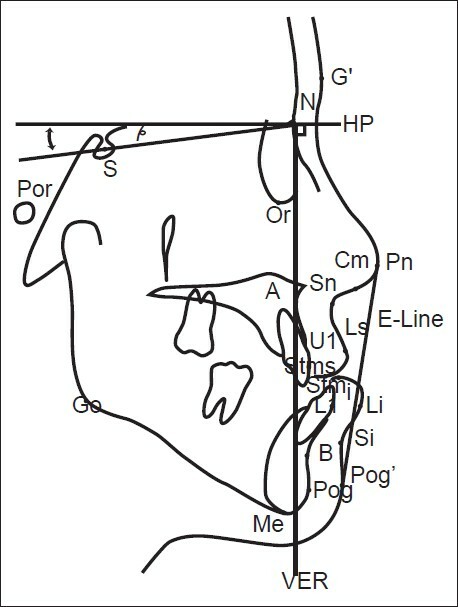 Changes in the facial profile following correction for mandibular prognathism. Br J Oral Maxillofac Surg 1989;27:277-86. 12. Lew KK, Loh FC, Yeo JF, Loh SA. Evaluation of soft tissue profile following intraoral ramus osteotomy in Chinese adults with mandibular prognathism. Int J Adult Orthodon Orthognath Surg 1990;5:189-97. 13. Chunmaneechote P, Friede H. Mandibular setback osteotomy: Facial soft tissue behavior and possibility to improve the accuracy of the soft tissue profile prediction with the use of a computerized cephalometric program: Quick Ceph Image Pro: v. 2.5. Clin Orthod Res 1999;2:85-98. 14. Gaggl A, Schultes G, Karcher H. Changes in soft tissue profile after sagittal split ramus osteotomy and retropositioning of the mandible. J Oral Maxillofac Surg 1999;57:542-6. 15. Hu J, Wang D, Luo S, Chen Y. Differences in soft tissue profile changes following mandibular setback in Chinese men and women. J Oral Maxillofac Surg 1999;57:1182-6. 16. Beyer JW, Lindauer SJ. Evaluation of dental midline position. Semin Orthod 1998;4:146-52. 17. Bell WH. Le Fort 1 osteotomy for correction of maxillary deformities. J Oral Surg 1975;33:412-26. 18. Dal Pont G. Retromolar osteotomy for the correction of prognathism. J Oral Surg Anesth Hosp Dent Serv 1961;19:42-7. 19. Legan HL, Burstone CJ. Soft tissue cephalometric analysis for orthognathic surgery. J Oral Surg 1980;38:744-51. 20. Lin SS, Kerr WJ. Soft and hard tissue changes in Class III patients treated by bimaxillary surgery. Eur J Orthod 1998;20:25-33. 21. Houston WJ, Jones E, James DR. A method of recording change in maxillary position following orthognathic surgery. Eur J Orthod 1987;9:9-14. 22. Conley RS, Boyd SB. Facial soft tissue changes following maxillomandibular advancement for treatment of obstructive sleep apnea. J Oral Maxillofac Surg 2007;65:1332-40. 23. Chen CM, Lee HE, Yang CF, Shen YS, Huang IY, Tseng YC, et al. Intraoral vertical ramus osteotomy for correction of mandibular prognathism long term stability. Ann Plast Surg 2008;61:52-5. 24. Al-Gunaid T, Yamada K, Takagi R, Saito C, Saito I. Postoperative stability of bimaxillary surgery in class III patients with mandibular protrusion and mandibular deviation: A frontal cephalometric study. Int J Oral Maxillofac Surg 2008;37:992-8. 25. Ingervall B, Thuer U, Vuillemin T. Stability and effect on the soft tissue profile of mandibular setback with sagittal split osteotomy and rigid internal fixation. Int J Adult Orthodon Orthognath Surg 1995;10:15-25. 26. Suckiel JM, Kohn MW. Soft tissue changes related to the surgical management of mandibular prognathism. Am J Orthod 1978;73:676-80. 27. Robinson WW, Spiedel TM, Isaacson RJ, Worms TW. Soft tissue profile change produced by reduction of mandibular prognathism. Angle Orthod 1971;41:227-35. 28. Marºan G, Cura N, Emekli U. Soft and hard tissue changes after bimaxillary surgery in Turkish female Class III patients. J Craniomaxillofac Surg 2009;37:8-17. 29. Chew MT. Soft and hard tissue changes after bimaxillary surgery in Chinese Class III patients. Angle Orthod 2005;75:959-63. 30. Koh CH, Chew MT. Predictability of soft tissue profile changes following bimaxillary surgery in skeletal Class III Chinese patients. J Oral Maxillofac Surg 2004;62:1505-9.